Go ape for Ninja Kiwi's new tower-defense title. In the unlikely chance that you've never encountered a tower defense game on your mobile phone before, they work a bit like this. First of all, you get a map with some starting cash. On the map, you need to buy and place various types of defensive towers using the cash you have, and watch them assault the invading waves of enemies. Rinse, repeat and expand with extra cash you receive for defeating the invaders. 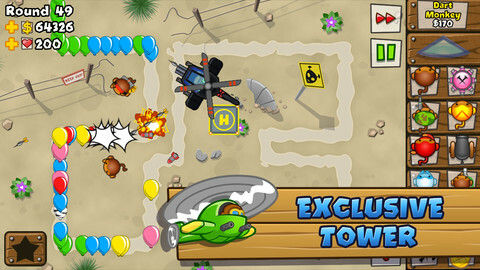 It's much the same in Bloons TD 5 but there are plenty of twists to keep this very familiar genre feeling fresh. 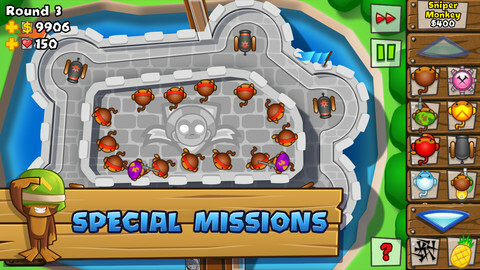 For a start, the units themselves are as varied as you could expect, consisting mainly of monkeys with various devilish tricks to slow down the invading forces or destroy the incoming threat completely, whether that's through sniper-fire or ninja-like interception. As you play the game, your profile levels up, and as your profile levels up you gain access to new and exotic defensive forces. This leveling up also rewards you with XP which you can use to upgrade the strength and versatility of each individual unit. Unusually for the genre, this particular game locks in your upgrade choices for each play session so you'll need to make some hard decisions. The enemies in the game are made of nothing more intimidating than wave after wave of balloons, but they come in as many different flavors as your units do. Some travel faster than others along the winding courses of the game, while others explode into even more balloons. Even more vexatious are the gigantic air balloons that require a pummeling from just about every unit, and the lead balloons which will make you wish you'd invested in more cannons earlier. As for the levels, no expense has been spared in the ambition and imagination of their design. There are the winding mazes that will be familiar to just about anyone who's ever played a tower defense game before, and then there are the planetary clusters where the incoming balloons take concentric orbital routes towards the end of the line. There are a huge number of levels too, packed full of increasingly frantic waves, and each stage has an easy, medium or hard difficulty level to keep everyone both happy and challenged. For a game that costs $2.99, it's a bit of a shame that there isn't a universal app so that it can be enjoyed on the larger screen of the assorted iPads, without the inherent fuzzy up-scaling of an iPhone app, but it's a minor complaint. There's enough charm and character in the music and artwork to carry the game through, although resolution purists may still bluster at the idea. 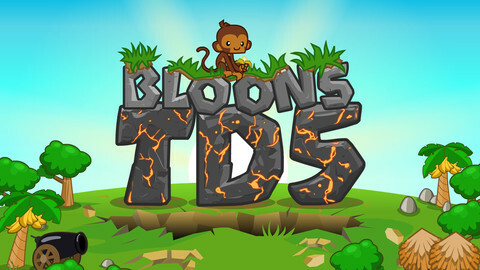 Bloons TD 5 is perfectly pitched to the mobile audience, even those who have grown a bit tired of the tower-defense genre. It's light-hearted but captivating, and there a difficulty setting for everyone, whether you're the committed tower-defense nut, the kind of person who likes to think they're better at these games than they really are, or the younger game who'll get a few hours of entertainment from assaulting the balloons with ease. As any parent will tell you, that's $1.99 well spent. What's Hot: Huge variety in the unit types and plenty of imagination in the level design. Great for gamers of all ages and abilities. What's Not: It doesn't look fantastic scaled up, and much progress can be made by spamming units at anything less than the toughest difficulty setting.